With the caveats in mind, it is possible to automate the “Work Offline” functionality and interrupt the network only briefly, long enough to dirty a single record which is all you need to be able to work offline. Even though when you’re back online and you’re editing different tables, those edits in all tables are all batched and won’t be committed until you choose to synchronize. 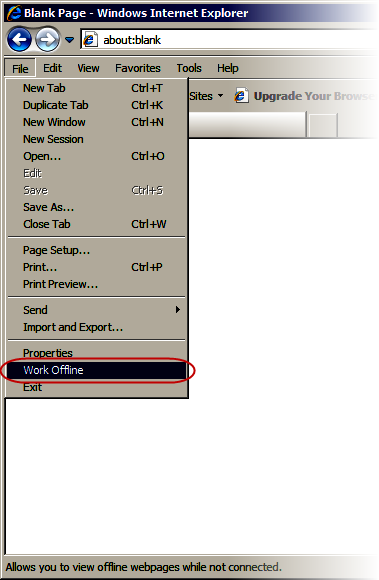 Whenever you want to enter the offline mode, you only need to call ToggleOfflineMode. It’ll then interrupt the network by making a API call that’s equivalent to selecting “Work Offline” in the Internet Explorer, dirty a record, then call the API again to restore the internet connectivity. 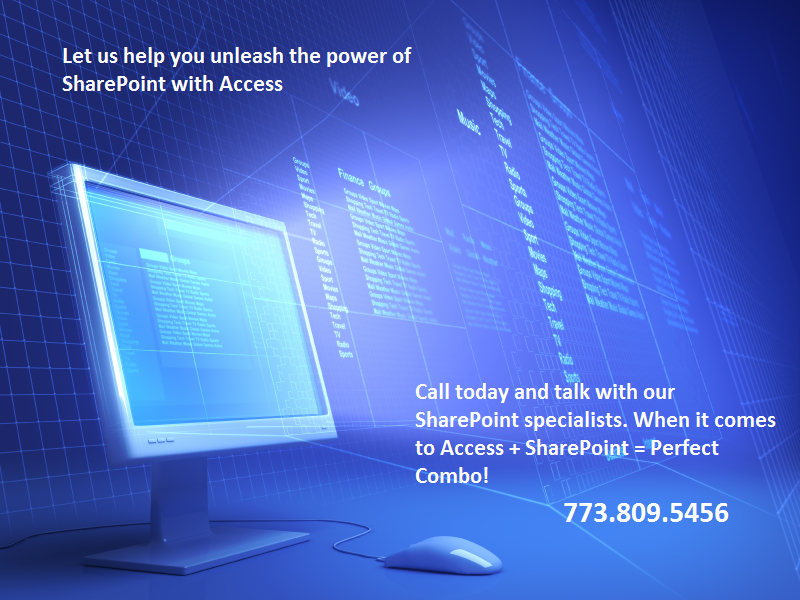 To make this possible you need two things; a linked SharePoint list that you can use as a target to dirty. It doesn’t have to be one of your actual data tables and you could even create a stand alone table with one column (besides the required ID column) and one row. The second thing is of course the code to call the API. Simply copy the code at end of this post & insert into a new blank module. But if you are using a regular Access database with linked SharePoint lists, there is currently no programmatic method to replicate the “Reconnect Tables” functionality, and therefore training users is the only way. If users have dismissed the Message Bar, they can still synchronize by either clicking on the status bar or going to Backstage. Still, its not any solution for this issue? The only way is to make a we app? I backed up my SharePoint site using Access. Upon completion of this backup, I deactivated my SharePoint site. Now when I attempt to access the data on my SharePoint site, I am unable to view any of the data in the tables because Access is trying to connect to SharePoint. How can I “access” the data store in the tables now that the SharePoint site has been decommissioned? Excellent, what a webpage it’s! This website presents valuable facts to us, keep it up. I am just starting to run into a user who has apparently gotten disconnected and keeps on processing with the local/cached local copy, totally unaware that they are disconnected. I have given instructions on how to select File and then click on reconnect all tables. Sure be nice if there were a way to automate that. Also a sure fire way to identify that someone is working offline and giving then a heads up each time they log in. Hi Bob, we use a xmlhttp function to check the SP URL on a timer to make sure there is a constant connection. If offline, it changes a picture/icon on the dashboard of the app to show its disconnected and informing the user that they are working offline. You could also do a msgbox to warn them as well with this process. 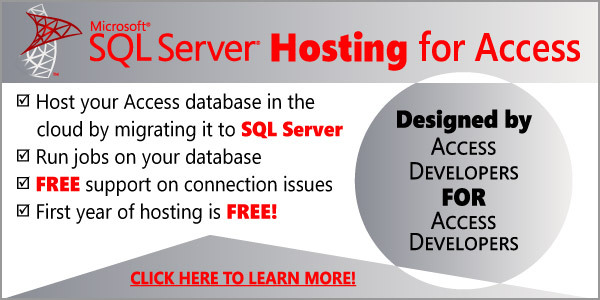 Why isn’t there a way to reconnect programmatically in a normal 2010 Access database? Haven’t you all realized that users, no matter how much training you give them, will never all be able to reconnect their own linked SharePoint lists. Hi, This is good info. I didn’t know about this new cache functionality, yhanks for the blog. 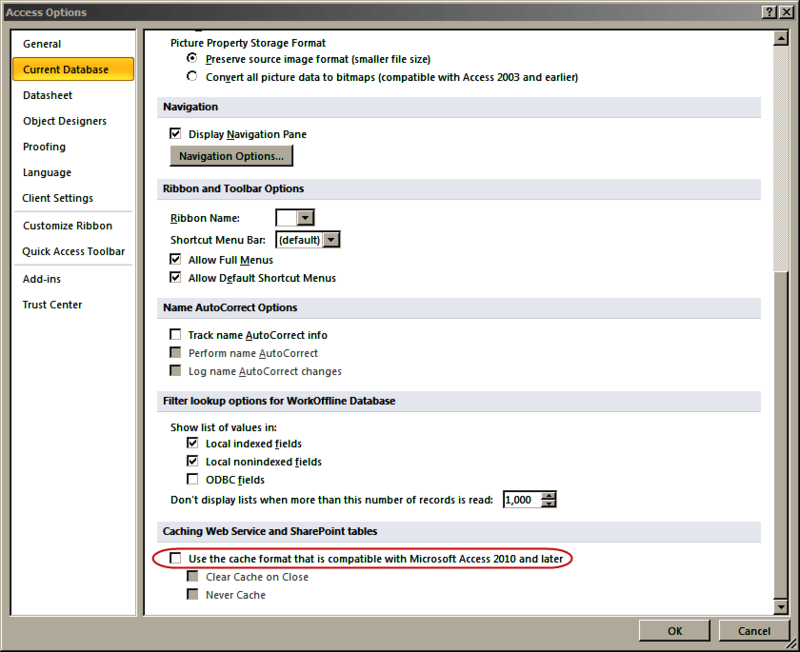 Is there a command or method to force Access 2010 to cache all the SP lists in the DB? Before i distibute the Access front end to users i would like to cache all the lists. I’m trying avoid the situation where a user attempts to use a particular SP list for the 1st time when they are offline and gets the “Linked table is unavailable” message. The only method i can see is to systematically open each list in turn before saving the front end.